Plantar fasciitis is probably the most common cause of pain under the heel. Symptoms often develop gradually over time and are worse first thing in the morning. Treatment includes reducing pain and inflammation, stretching exercises, massage, taping and correcting foot biomechanics. Symptoms of plantar fasciitis consists of pain under the heel which develops gradually over time. Often pain may radiate forwards into the arch of the foot. There may be tenderness in the sole of the foot and under the heel when pressing in. This can range from being slightly uncomfortable to acutely painful. Pain is usually worse first thing in the morning and improves during the day. This is because the foot has been in a relaxed position all night. As a result, the plantar fascia gradually tightens up and shortens. After walking around, the soft tissues in the foot warm up and stretch, therefore pain decreases. Later lin the day as fatigue sets in pain returns again. This may be also noticeable when sitting for long periods before then starting to walk again. A professional therapist would undertake a full assessment, including case history, physical examination, andbiomechanical analysis . They may use X-rays or other imaging techniques to diagnose plantar fasciitis. Other heel injuries, particularly bruised heel can have similar symptoms. 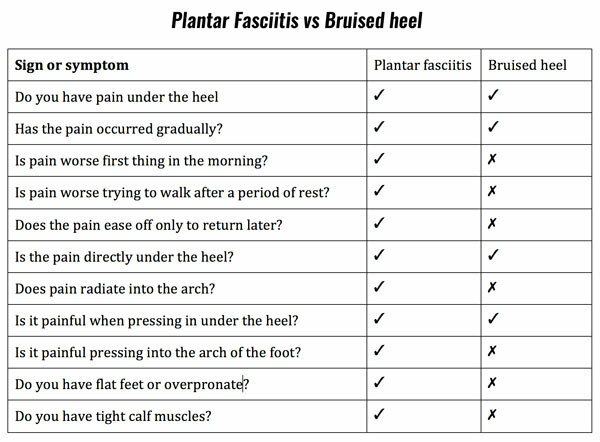 Below we outline some common differences between plantar fasciitis and bruised heel. The Plantar Fascia (or plantar aponeurosis) is a broad, thick band of tissue which runs from under the heel bone (calcaneus), to the front of the foot. Its function is to provide support to the foot when standing and shock absorption when running. 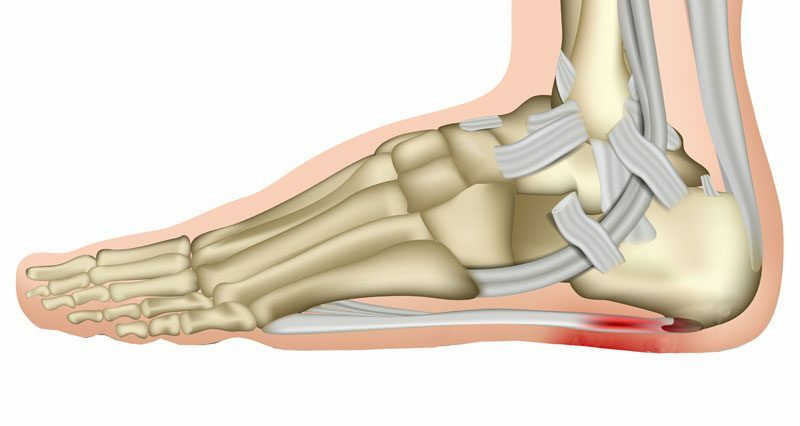 Inflammation or degeneration of the tendon where the fascia originates at the heel causes pain. Sometimes a bony growth, known as a heel spur develops at the point where the fascia attaches to the heel. But not all cases of plantar fasciitis have a heel spur, and many heel spurs have no symptoms. 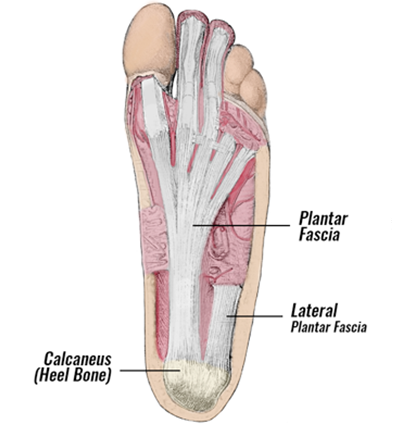 Plantar fasciitis or Plantar fasciopathy? The term Plantar fasciitis refers to inflammation (‘itis’ means inflammation). Traditionally people thought inflammation was the issue. However, studies have shown actual inflammatory cells are not present in most cases. Therefore, degeneration of the tissues is thought to be a more likely cause. Hense the term Plantar fasciopathy is more appropriate. Overpronation is where the foot rolls in or flattens too much when running or walking. As the foot flattens, it stretches the plantar fascia more than normal, therefore increasing the strain on the tissues. A foot which has a high arch is known as pes cavus. This foot type is often rigid and therefore unable to absorb shock and impact forces. Therefore, the strain on the plantar fascia is increased. Wearing inappropriate footwear such as very flat and unsupporting shoes can increase the likelihood of developing plantar fasciitis. If you are a runner then choosing the correct running shoes for your foot type is essential. If you overpronated then a motion control shoe is best. Oversupinators often have a high arch and a neutral shoe with cushioning is usually advised. Overweight individuals or those who do a lot of heaving lifting at work place increased loads on the foot. Therefore, increasing the chances of developing heel pain. If you have tight calf muscles or plantar fascia then you are at a higher risk of developing plantar fasciitis. Or, if you have tight hamstrings or gluteal muscles then this also increases your risk because of the effect they have on foot biomechanics. Treatment consists of reducing pain and inflammation, stretching the plantar fascia and lower leg muscles and identifying potential causes. A gradual return to fitness is important. Heel pain can be very stubborn to treat and often a combination of approaches is best in treating plantar fasciitis. Applying the PRICE principles of protection, rest, ice, compression and elevation to relieve pain and inflammation. Apply ice or a cold therapy wrap. Do not apply ice directly to the skin as it may cause ice burns. Wrap ice in a wet tea towel or use a commercially available gel pack. Apply ice or cold therapy for up to 10 minutes every hour whilst it is particularly painful. Reduce this to 3 times a day as symptoms improve. Plantar fasciitis taping is an excellent way of instantly relieving symptoms. It works by supporting the arch of the foot and reduceing the strain on the plantar fascia. This therefore allowa the tissues to heal. You may need to apply tape regularly until symptoms resolve but many people notice an immediate improvement. Protect and support the foot by wearing comfortable shoes or trainers. Hard or flat soled shoes are likely to make symptoms worse. You can wear a cushioning heel pad or insole to help relieve pain. However, if overpronation is an issue then orthotic type insoles will be more appropriate long term. Stretching exercises can begin as soon as pain allows. 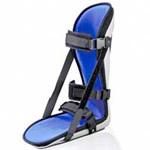 A plantar fasciitis night splint is a very effective way of stretching the plantar fascia under the heel. You wear the splint overnight, or as long as you can until it becomes too painful. Gradually you should be able to wear it for longer because it helps prevent the fascia tightening overnight. A professional therapist can make an accurate diagnosis and advise on a full treatment and rehabilitation plan. A doctor may prescribe anti-inflammatory medication such as ibuprofen. This may be effective in the early stages to reduce pain and inflammation. But long term use may actually inhibit healing. The therapist may use electrotherapy such as ultrasound or laser treatment to reduce pain and inflammation. In the later stages, a professional therapist may apply deep tissue massage to help stretch and relax the plantar fascia. They may also use gait analysis to identify any biomechanical issues and prescribe orthotic inserts. 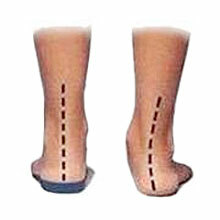 These help control the position of the heel, reducing overpronation and therefore the strain on the foot. For more stubborn injuries a doctor may use a corticosteroid injection. Platelet-rich plasma injections have also been shown to be effective. If symptoms do not resolve then surgery is an option but this is rare. Read more on treatment and rehabilitation. Surgery is used in around 5% of people whose symptoms do not improve after a minimum of nine months, even after continuous treatment. However, the success rate is still only estimated at around 70-80%. In most cases now, a procedure called a plantar fascia release is performed. This releases (cuts) between 30 and 50% of the fascia’s fibers. This helps to reduce the stress on the fascia. Complications can include nerve damage, fallen arches, infection and ongoing symptoms. Recovery after surgery if successful is around 9 to 12 weeks before the patient may return to work. Exercises to stretch the plantar fascia and the calf muscles are important. Resting alone may reduce pain and inflammation but if part of the cause is tension in fascia then the injury is likely to recur. Calf stretches with the leg straight (to target the larger gastrocnemius muscle) and with the knee bent (targeting the lower soleus muscles) can be done 3 to 5 times a day. Hold stretches for up to 30 seconds at a time and they should be done pain-free. Strengthening exercises are not normally needed, however scrunching a towel up with the toes can get the small muscles of the foot working. Read more on plantar fasciitis exercises.